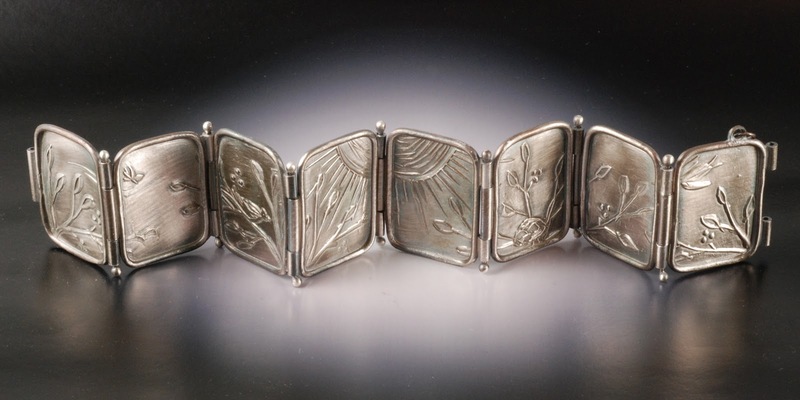 This morning, my latest Master Muse project is up -- this traditional hinged panel bracelet. My approach was to utilize a standard rubber carving block to create a texture block of a continuous scene for the panels. 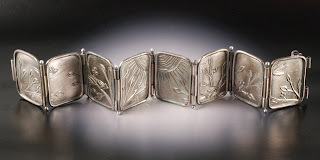 Then I used an extruder to form the borders and hinges, and pinned them together with beaded Argentium wire pins. The clasp is a friction fit pin, secured by a chain. Originally I planned to enamel the bracelet panels, but I ran out of time. Perhaps when the bracelet returns to me I'll snip the pins and do that. Check out the more detailed synopsis and all the other tutorials on Tonya Davidson's Master Muse site. It is beautiful Vickie !!! !